XAG/USD is currently trading around $14.57 marks. It made intraday high at $14.59 and low at $14.49 levels. Intraday bias remains neutral till the time pair holds key resistance at $14.62 mark. 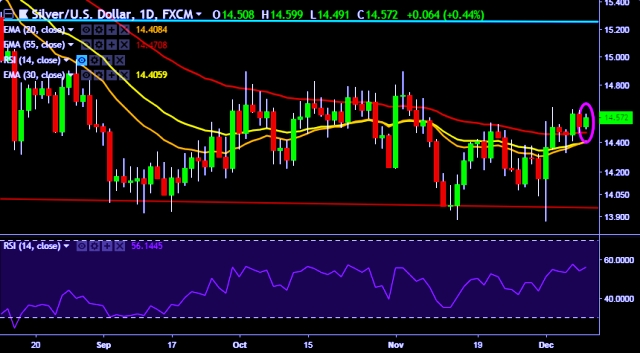 A daily close above $14.60 will test key resistances at $14.72, $14.78, $14.92 and $15.08 marks respectively. On the other side, a daily close below $14.47 will take the parity down towards key supports at $14.35, $14.22, $14.17, $14.07, $13.90, $13.82, $13.68 and 13.51 marks respectively. We prefer to take short position on XAG/USD around $14.58, stop loss $14.64 and target of $14.48/$14.35.